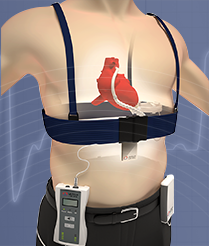 Leviticus Cardio’s wireless power transfer technology, Coplanar Energy Transfer (CET), combined with an existing Ventricular Assist system, provides a new, robust, comprehensive hybrid solution for CHF patients. Leviticus FiVAD™ is wirelessly charged using an external belt along with an internal battery that lasts 6-8 hours. Patients may expect an improved Quality of Life with Leviticus FiVAD™ because they are free from external equipment for many hours per day. Our solution uses a proprietary technology named Coplanar Energy Transfer (CET) and it works with all commercially available VADs. *Investigational device only. Not for sale. Only for use in a clinical trial setting.